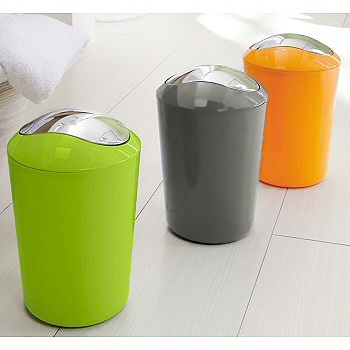 Acrylic bathroom waste basket designed and produced by well-known German brand Kleine Wolke, established in 1968, and is backed by their quality guarantee. This waste paper basket has a glossy finish with a shiny chrome color swivel lid allowing easy access with a touch of a finger. The lid swings open and then immediately closes. Orange: Bright pumpkin orange with chrome finish swivel lid. Anthracite Grey: Beautiful medium tone grey with chrome finish swivel lid. Coordinates nicely with our anthracite grey rugs. Royal Blue: Bright deep blue with chrome finish swivel lid. Berry: Purple berry tone with chrome finish swivel lid. Spring Green: Bright yellow green with chrome color swivel lid. Paper White: Beautiful glossy paper white waste paper basket with chrome swivel lid. Polar White: Beautiful glossy bright white waste paper basket with chrome swivel lid. Taupe Brown: Elegant taupe brown waste paper basket with chrome swivel lid. Red: Bright red waste paper basket with chrome swivel lid. Yellow: Shiny yellow waste paper basket with chrome swivel lid. Turquoise: Bright turquoise waste paper basket with chrome swivel lid. Black: Classic black waste paper basket with chrome swivel lid.